Alisha thought that it would be years before she could afford her own home. But at 23 years old, her dreams are becoming reality. She’s graduated from the nursing program at Grant MacEwan University, and put a deposit on a new townhome in Bearspaw. Alisha is a busy young woman who enjoys a number of interests. Travelling, camping, singing, and enjoying live theatre are some of the ways she likes to spend her spare time. 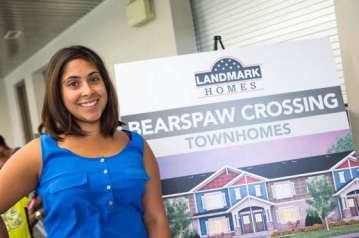 As her graduation drew closer, Alisha started to think about the next goal on her list—buying her own home. “When I was on one of my clinical placements for school, which happened to be at the Grey Nuns Hospital, I noticed some townhouses being built just across the street. It was there that she heard about the First Place Program, and she went online to learn more. Alisha purchased a lot with the Manchester 3 floor plan, which offers 1,362 square feet of space. It’s one of four available floor plans. She’ll be living in a development built by Landmark Homes, a builder known for high-quality projects and “green” construction practices. Bearspaw Crossing Homes feature energy-efficient appliances that are good for the environment and help reduce utility costs for homeowners. Although Alisha currently lives in southeast Edmonton with her mother and brother, the Bearspaw location appealed to her. The neighbourhood is four minutes from the Henday, and close to grocery stores, medical services, Southgate Centre and South Edmonton Common. If she doesn’t feel like cooking, there are several restaurants where she can pick up some dinner or spend time with her family and friends. Alisha soon discovered other benefits to moving into an existing neighbourhood. She loves to read, and the Whitemud Crossing library is nearby. She likes walking, and she’ll be close to Blackmud Creek Ravine and several parks. The City’s First Place program teams with banks and builders to develop attractive townhouses on undeveloped building sites in existing neighbourhoods. First Place homes sell at market rates, but portions of the mortgage related to the land cost are deferred for five years, providing an attractive level of affordability. Owners cannot rent out the property for the period of the deferral, and the condo board ensures a high standard of exterior maintenance. “This home means independence and an exciting new milestone in my life,” says Alisha. After an educational journey involving several countries and provinces in recent years, Janna Plewes is excited about making her home in one of Edmonton's First Place developments. 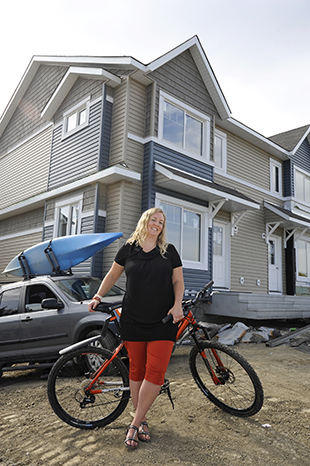 She's was one of the early buyers for First Place homes in the Caernarvon neighbourhood, where units will be approaching completion in November 2013. "I came to Edmonton to work with the City in February 2012 and am very happy with my job," say the 30-something social worker. "I plan to be here for a while, and the opportunity to buy my first home was very appealing to me." First Place homes sell at market rates, but portions of the mortgage related to the land cost are deferred for five years, providing an attractive level of affordability. Owners cannot rent out the property for the period of the deferral, and a condo board ensures exterior maintenance is top-notch. "That was another bonus," says Janna. "The condo fees are less than half of what I saw in other developments." She also likes the design of the project, built on a vacant school site declared surplus to school board needs. "I like how First Place homes improve community life in general, and especially neat to have community input into the design of the project. That's fantastic, and something the typical development doesn't involve." Janna worked with the builder to choose interior colours and upgrades that would really make it her own home, and she can't wait for moving day. "You are really building your future and your life with a home like this," she says. "I have led a rather nomadic life while working across Canada and internationally and completing my Master's, it's a big deal to settle down for five years. "But this program is set up for young professionals who want to settle in Edmonton, and it seems geared for me. It's a good fit for me and where I'm at in my life right now." Janna will revert to the full mortgage obligation in five years, when she expects to have savings and an income situation that will help her manage the transition. In the meantime she likes the comfort of a new-home warranty on the three bedroom, two-and-a-half bath home, the expectation of a nine-minute commute to downtown Edmonton, and the pleasure of being able to keep her kayak and bicycle with her, rather than parking them at friends' places. More bonuses: Janna will qualify for financial incentives for her energy-efficient appliances, and she'll be living in a project built by Landmark Homes, a construction company with a "green" reputation for its constructed methods and materials. I am a health safety coordinator with Epcor, and I am also an EMT with a private ambulance company. What's your favorite thing about your new neighbourhood? I like the neighbourhood because it is very central and close to many amenities; the hospital, the police station, the fire hall, grocery stores, malls and libraries. Plus it is close to my daughter's school and the new LRT system will be close by in about 5 years. My favorite thing about my/our life? I have a sense of independence and accomplishment from owning my first home! It feels like my daughter and I have really made it - that we are able to get our own house - it is a big sense of accomplishment for me. What should people know about the first place program? The First Place Program is for everyday people. It's not a certain clientele in the First Place program - it's every walk of life. I was living in my parent's house thinking about saving up the money and going to the traditional route of owning my own home and then I found this on the Internet. It was karma; everything was lining up. Being able to have my own home - that just opens up so many more doors and possibilities of where I can go and what I can do. What are the benefits of buying in a First Place Program neighbourhood? You get a sense of belonging and a collective feeling that you are in a similar situation; you've all risen to the challenge and have the same sort of accomplishment in getting this home. It gives you a sense of camaraderie.